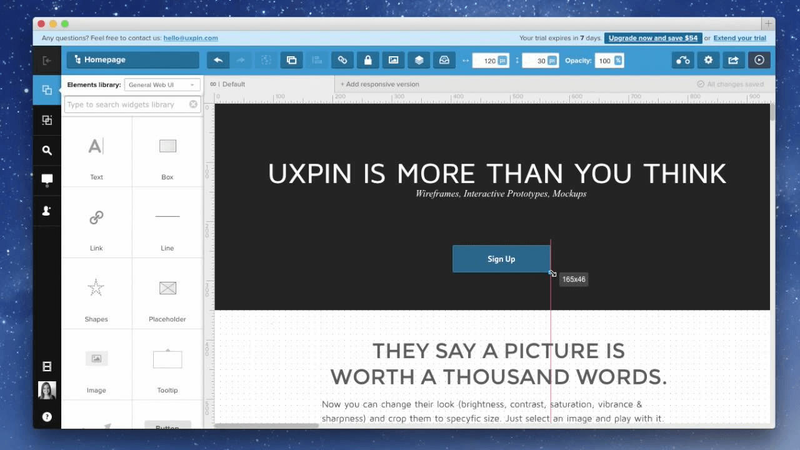 UXPin is a cloud-based prototyping platform to create and visualize interactive designs. It is a powerful design tool with bundle of built-in user interface libraries. It allows the user to prototype using built-in interactions and animations.In addition, you can customize the elements by using CSS code. 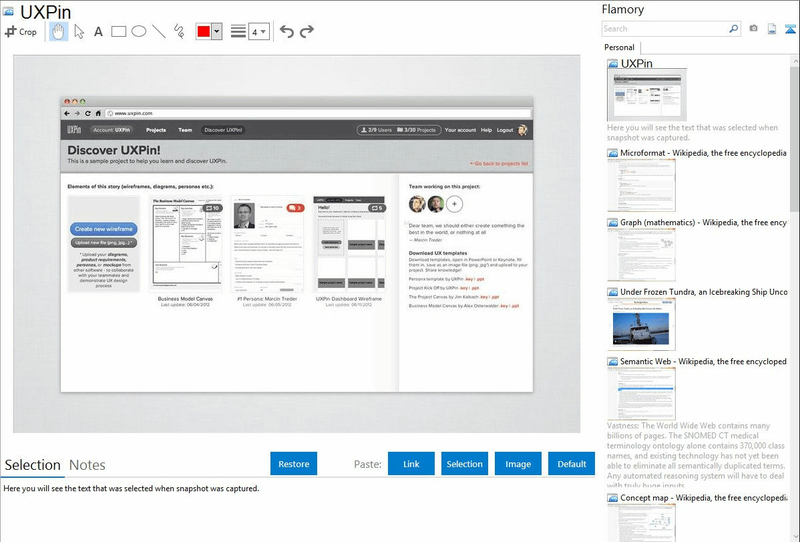 This software supports seamless collaboration that allows co-design in the same prototype, which brings the client into the process in order to comment directly on the elements. 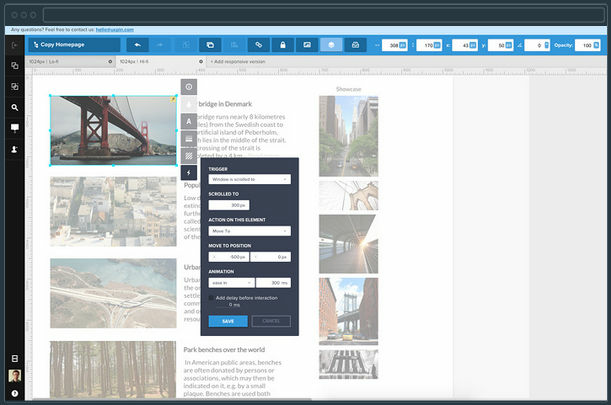 In addition, it provides flexible workflow that turns photoshop design into prototypes. Since it preserves all photoshop and sketch layers there is no need for you to rebuild your prototype. How much does UXPin cost ? The pricing for UXPin starts at $9.0 per month. 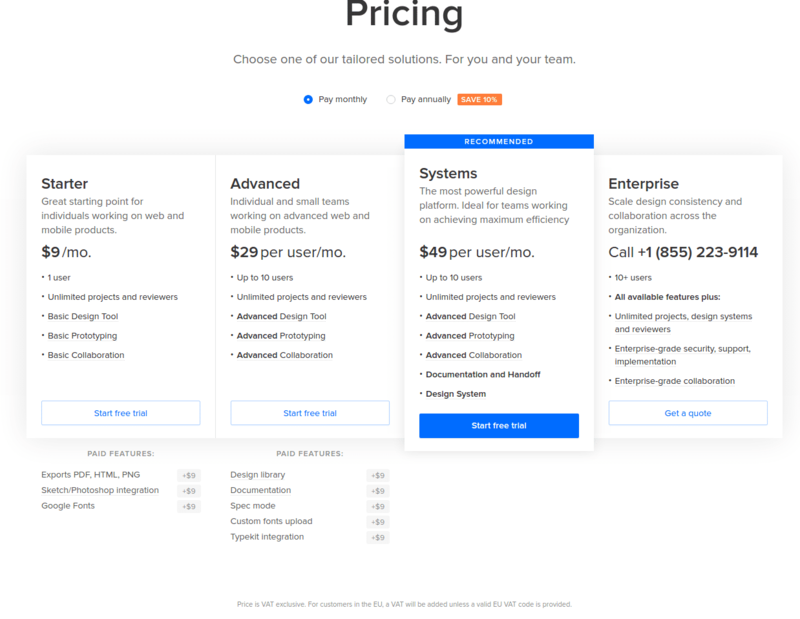 UXPin has 3 different plans such as - Starter at $9.0 per month, Advanced at $29.0 and Systems at $49.0 per user per month. UXPin also offers a custom plan based on the customer's request. Great starting point for individuals working on web and mobile products. For all Plans, Price is VAT exclusive. For customers in the EU, a VAT will be added unless a valid EU VAT code is provided. Individual and small teams working on advanced web and mobile products. Scale design consistency and collaboration across the organization. Pros: Very easy to learn. Integrates with GitHub, Slack, and JIRA. Creates CSS files from designs for use by our developers. 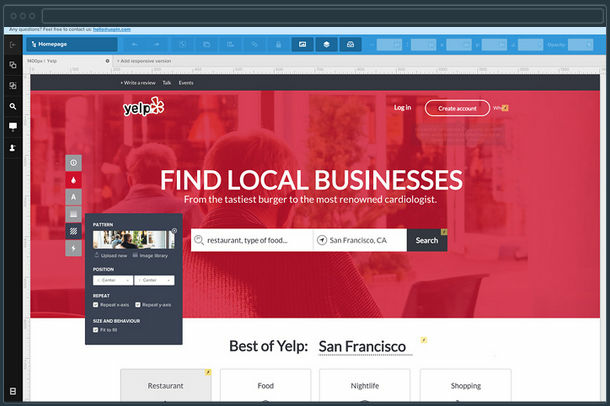 Has the ability to autoload colors from existing websites. 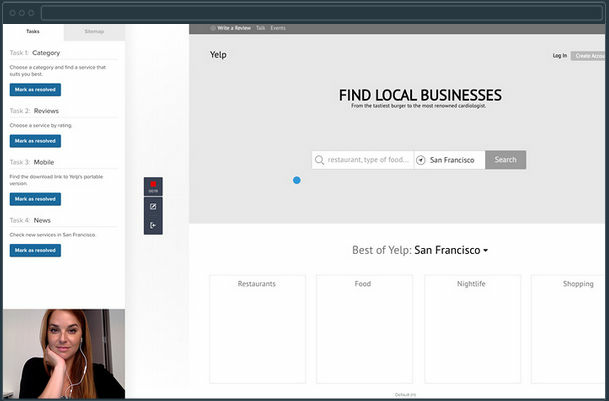 Has a feature that let's you see the user's cursor as they are reviewing prototypes which enables usability testing. Included with the licensing is an assigned account manager available to assist with any questions. Cons: Doesn't integrate with Confluence. However, you can create a link to the protoypes and include that link on Confluence. "Very easy to use, yet powerful." 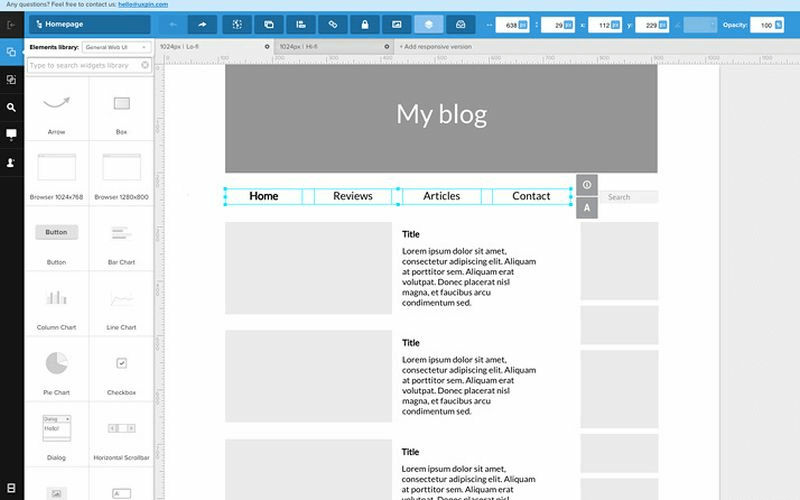 A grat tool for creating wireframes. It is super easy to use, yet has all the features I need. Used for projects up to 100 mockups. The new offline version gives flexibility in usage. The icon library could be larger, but I guess you will never get enough of those. Creating mockups and working with them as a team, client included. Building documentation on the mockup. Perfect for organizing your images and color palates. Pros: UXPin is the perfect tool for organizing your images and color palates. If you are working on large scale projects leveraging a tool like UXPin is a must. Cons: The interface is clunky and can be very difficult to use and understand. Does not do true UX work well. "Altrrnayive to just in mind"
Clicking items within asset tree can be hairy. Could use more progamatically driven multistates. We use it to prototype ui ideas. The design system, documentation, and commenting systems are outstanding in design and function and make communicating and collaborating extremely efficient. Contextual comments, followup, and closing items are efficiently and intuitively designed. - Animations/Interactions are buggy and do not always yield what you have designed. - Symbol library intermittently displays a square icon rather than a preview of the symbol and you must restart to fix. - Application (desktop version) looses connection sometimes and you have to restart to reconnect - add a reconnect button somewhere. Overall, the product is fantastic but there are issues that can be very frustrating and stall your workflow; I assume the team is working on them. Do a demo and then build some interactive elements while on trial. If you find yourself bumping your head on bugs while building trivial interactions, expect those issues to compound as you start building prototypes. We are using UXPin for UI/UX design and collaboration. The collaboration and handoff tools are exemplary and overall the prototyping tools are excellent. I have been able to execute on multiple designs while dealing with the slight learning curve and feel UXPin delivers a great set of tools to make this process efficient. This is my first choice for creating protoypes. Pros: Sometimes we need to create prototypes quickly and easily and this tool helps me to do that. It has an excellent user experience. Cons: They have provided everything I need to create prototypes, however, the subscription should be more than 7 days. 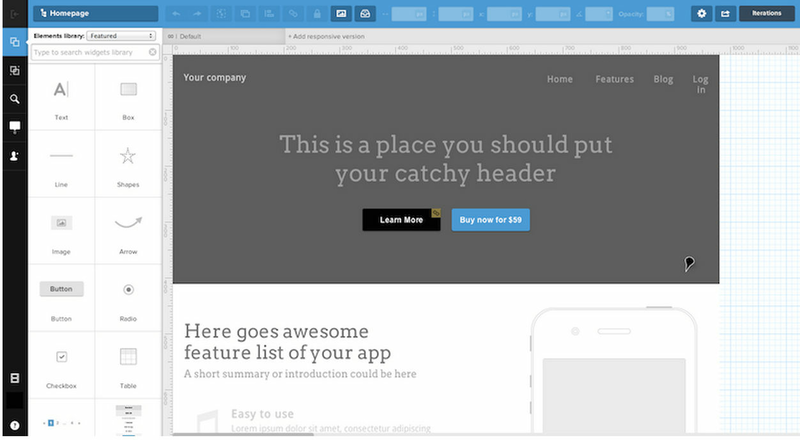 Overall: This tool helps me to create wireframes in a very easy manner. Pros: I like how easy it is to use. It's nice that you can create different projects and organize them. I also like the user interface. Cons: It was a little tricky to figure out at first. I'm proficient in photoshop and in my mind I kept comparing. Pros: UXPin is a great wireframing tool with the user feedback mechanism built right in. The main thing I like about it is that there's no connecting my sketch account to my invision account just to gain some basic user feedback. Additionally, it's easy to get up and running - I created an account and was able to figure out all of the basics that I needed within the first hour - getting me up and running in no time, and collecting feedback from our CEO on a project I'd been trying to push through. All in all, it's a great tool. Cons: Cons... I'd say it could be a little more user friendly. Some of the buttons / CTAs on the interface are small for my taste. also, I'd prefer it if there was some color incorporated. But these are all relatively small things. It's a solid product and I like 95% of it. Overall: Ability to make instant changes to wireframes and have them immediately incorporated into the interactive wireframe I send to users. I like the fact that if I can't change the properties of a certain object, I can usually use custom CSS to make something look exactly how it should render for web prototypes. That's a big win and something a lot of other high-fidelity prototyping tools don't have. ...but I don't have all CSS properties to work with. Also, interactions are VERY POWERFUL, but pretty hard to learn at first. Milk the trial period & ask questions if you have them - their support is pretty good. We're using it primarily to prototype with an old design system, but also to create a new design system for our software as well. Pros: The best thing about UXPin tool is how versatile the libraries it offers are. It is great for quick sketching a product, plenty of libraries are free, so you can sketch out a product in just a few hours. Cons: I think adding animation and gestures could have helped a lot. Other than that it is really nice even with free pricing plan.